More flowers and brighter blooms. More flowers, brighter blooms and strong, healthy growth. Rich in natural nutrients for prolific flowering and vigorous growth. Extended release – keeps on feeding. Great for other climbers such as honeysuckle. Supplied in a resealable, 900g pack. 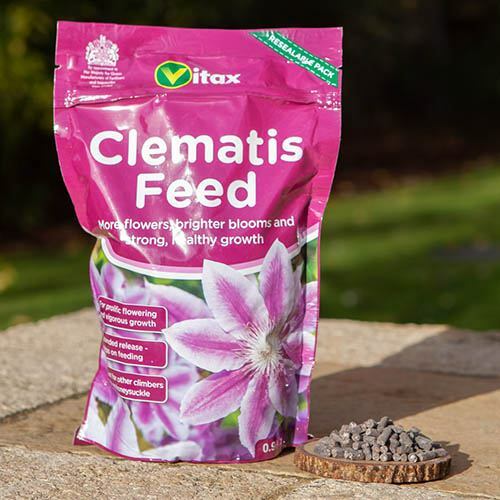 Vitax Clematis Feed is a balanced feed with an organic base which promoted the growth and flowering of clematis and other climbing plants such as honeysuckle, passion flower and ivy. The feed is rich in natural nutrients, including potassium, to encourage vigorous growth and prolific flowering. Clematis should be planted in humus-rich soil in a shady spot where their roots are protected from the sun. To help prevent clematis wilt, clematis should always be transported 6 inches deeper than the level of the starter pot. Apply the fertiliser in March and repeat applications every three months during the growing season. Sprinkle evenly 60g/m square of pellets evenly around the base of the plant. Work into the soil and water thoroughly. All newly planted clematis must be well watered during dry weather. Plants will benefit from an application of Vitax Clematis Fertiliser (60g/m square) spread evenly around the base when growth is vigorous.